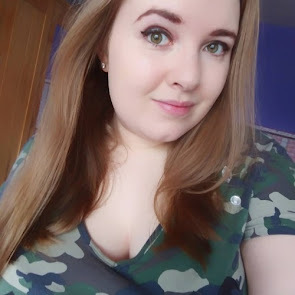 Today's post is different from the usual! You might be used to fashion and beauty posts accompanied with some life things mixed in, but not today! As you might see in the header for my blog, the last section is 'nerdfest.' This is my little nerdy part on the blog where I just geek out and have a fangirl moment. I have done a couple of posts for this section before, but this is about to get taken up a level. So if you're not much of a fan of all things geeky or Hobbit/Lord of the Rings (LOTR) related, then you might want to leave now! If not, then keep on reading and divulge into this obsession with me! If you've followed me for a while, you will know how much I love the LOTR movies and now the amazing Hobbit films. LOTR has been watched to death and the two current Hobbit films are just refueling my love for the story. 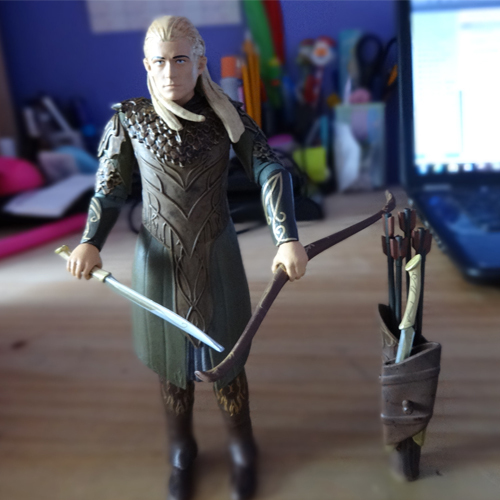 I spotted a Legolas figure while in The Works the other day and my sister kindly purchased him for me as a thank you for driving her places. He's a nice little £2.99 in store right now in their sale, so she bought him and here he is! Legolas is my favourite Elf in the LOTR, and though he isn't actually in the Hobbit books, he was included in the films which I didn't mind! I think it was by fan demand actually. 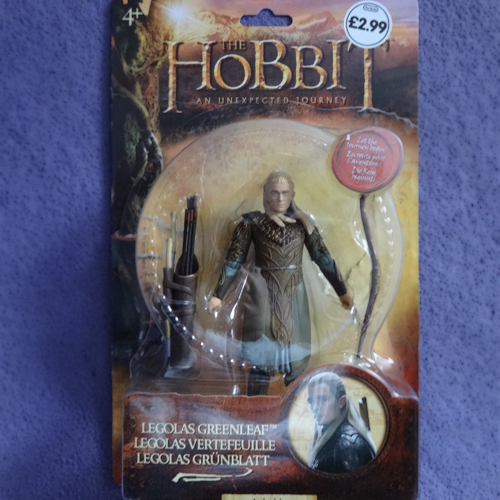 The figure doesn't look a lot like Orlando Bloom who plays the Elf, but there is enough resemblance to get by with! He comes with a bow and sword, plus a quiver that has a few arrows and a dagger inside! After I assembled him with his gear, he was placed on my nerd shelf! 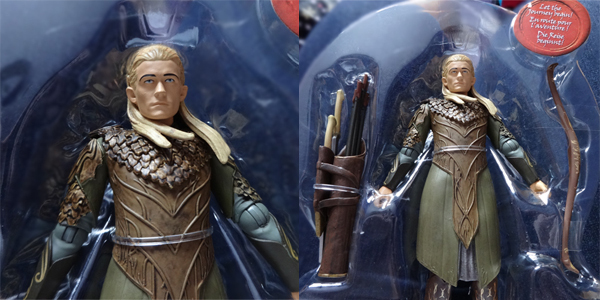 Legolas is about the size of my hand, so quite decent. Then a few days later we wandered into town again and into the Entertainer. They had a sale on, so I set my Dad the task of finding me the figures in case they had some, and they did! The choices were: Bilbo & Gollum, Balin & Dwalin or Fili & Kili. Dilemma. Well as you can see from below, Fili and Kili won as they are my fave duo in the Hobbit films and the actors that play them are oh-so good looking. They were £6.50 after being reduced from £13. Above: Kili, who doesn't look much like Aidan Turner. 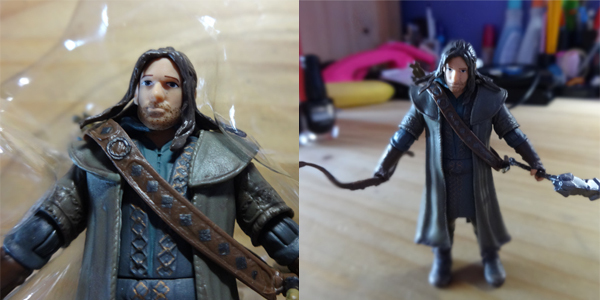 Little Kili came with a war hammer and bow, and the quiver is already attached to him. Above: Fili, who again looks not a lot like Dean O'Gorman who plays him in the films! 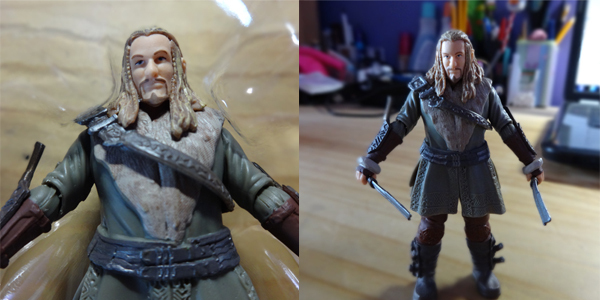 Fili comes with two swords/daggers! And here they are both equipped for battle. I don't mind that they don't look exactly like the actors, as the rest of the figures are perfect to how they looked in the movies. 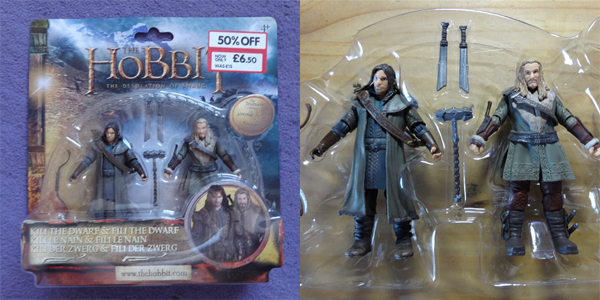 I'd like to have got these in the same size as Legolas, but these were all that they had! 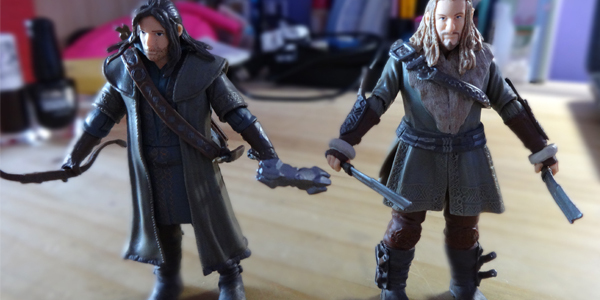 These are the size of my palm, so small enough to go on the nerd shelf alongside Legolas!